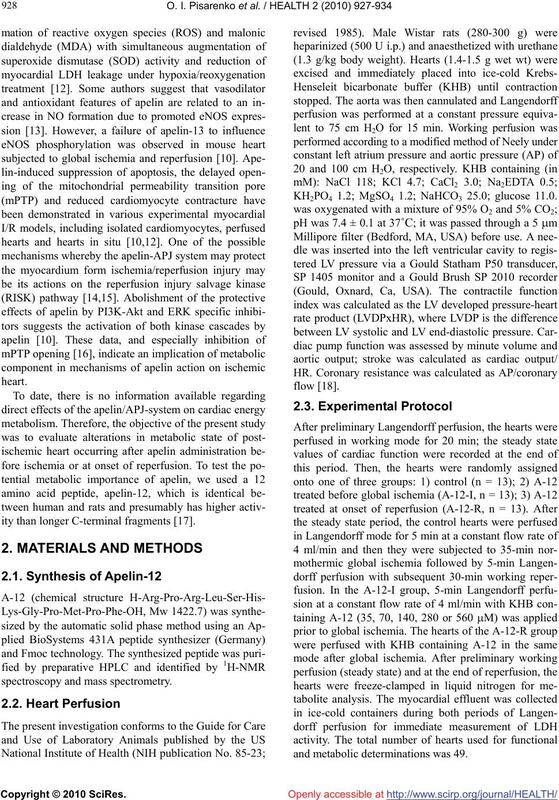 Oleg I. Pisarenko*, Valentin S. Shulzhenko, Yulia A. Pelogeykina, Irina M. Studneva, Denis N.
Received 27 March 2010; revised 24 April 2010; accepted 26 April 2010.
sive effects in normal and failing myocardium [7-9]. attractive target for heart failure therapy. ity than longer C-terminal fragments . 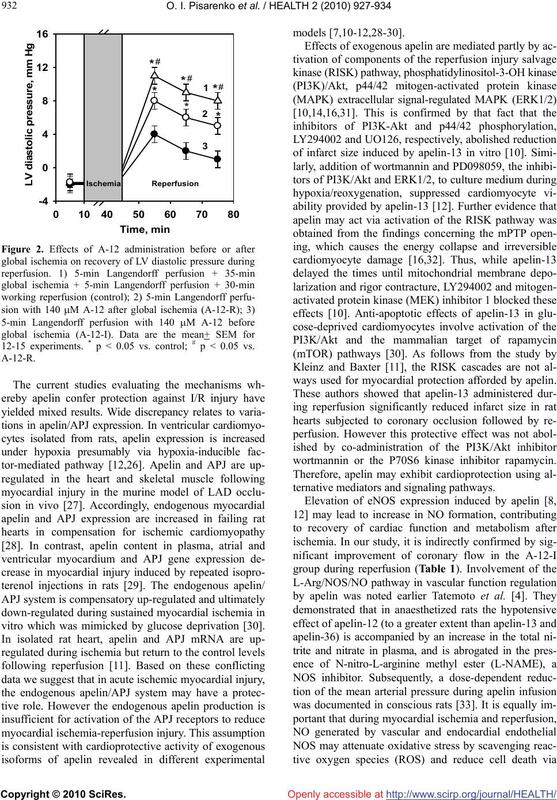 KH2PO4 1.2; MgSO4 1.2; NaHCO3 25.0; glucose 11.0.
and metabolic determinations was 49.
and Assay of LDH Activity. Bergmeyer and Bernt  using pyruvate as substrate. p < 0.05 was considered statistically significant. -12 before and after of ischemia is presented in Table 1.
vessels in response to A-12 administration. control and composed 81 ± 6% of the steady state value. from the steady state value. vs. control group; b p < 0.05 vs. A-12-R group. dial energy state at the end of reperfusion. 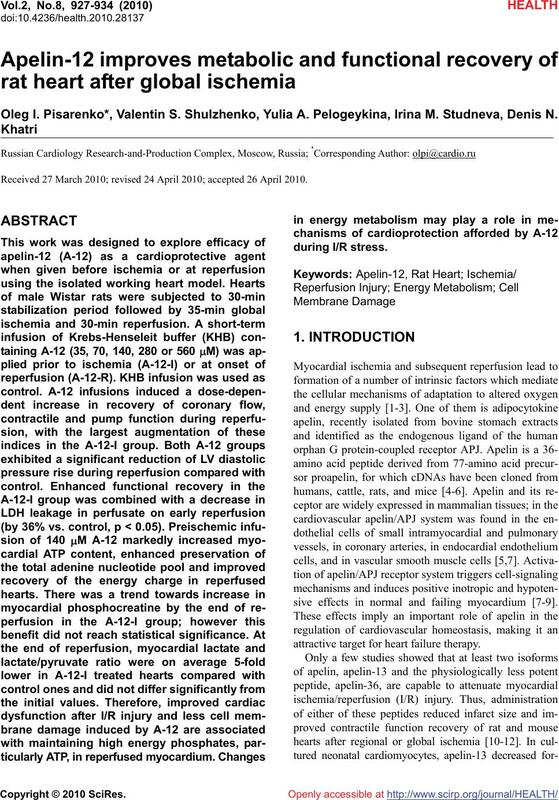 energy charge (EC) = (ATP + 0.5ADP)ATP + ADP + AMP. mol/g of dry wt, correspondently. 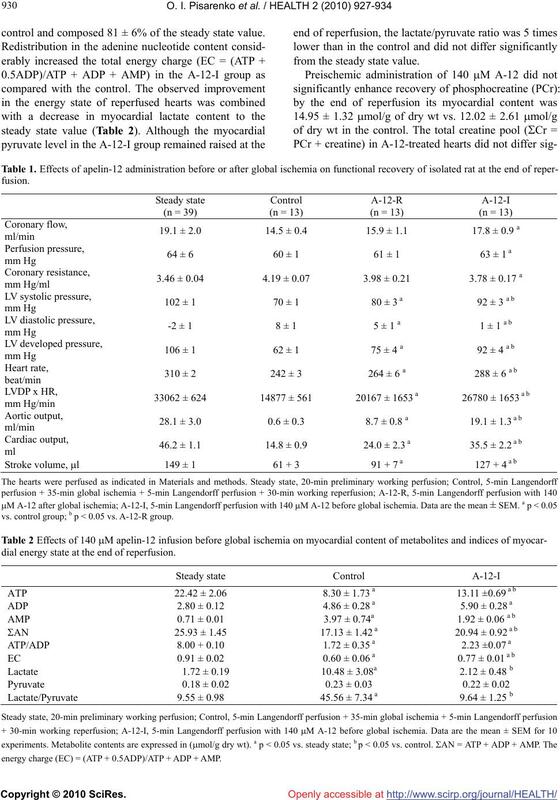 dial effluent before and after global ischemia (Table 3). the main energy substrate of isolated perfused hearts. leakage before and after global ischemia. b p < 0.05 vs. the value before ischemia. (A-12-I). Data are the mean + SEM for 12-15 experiments. * p < 0.05 vs. control; # p < 0.05 vs. A-12-R.
12-15 experiments. * p < 0.05 vs. control; # p < 0.05 vs.
vitro which was mimicked by glucose deprivation . ways used for myocardial protection afforded by apelin. wortmannin or the P70S6 kinase inhibitor rapamycin. ternative mediators and signaling pathways. 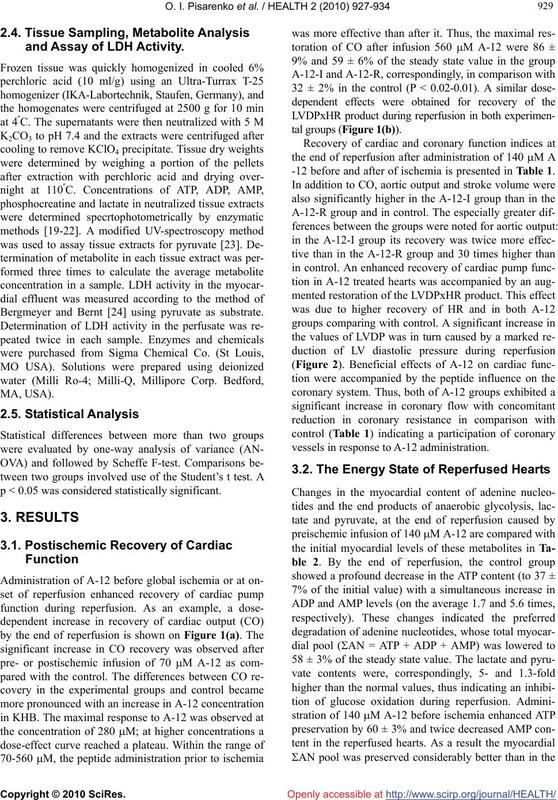 is inhibited in myocardial tissue by I/R [12,36]. ture and ROS generation during reperfusion [37,38]. Verma, S., Fedak, P.W., Weisel, R. D., Butany, J., Rao, V.
 Smith. C.C., Mocanu, M.M., Davidson, S. M., Wynne, A.
endogenous peptide ligand for the human APJ receptor. Boucher, J., Masri, B., Daviaud, D., Gesta S., Guigne, C.
APJ receptor. Journal of Neurochemistry, 74(1), 34-41.
mechanism. 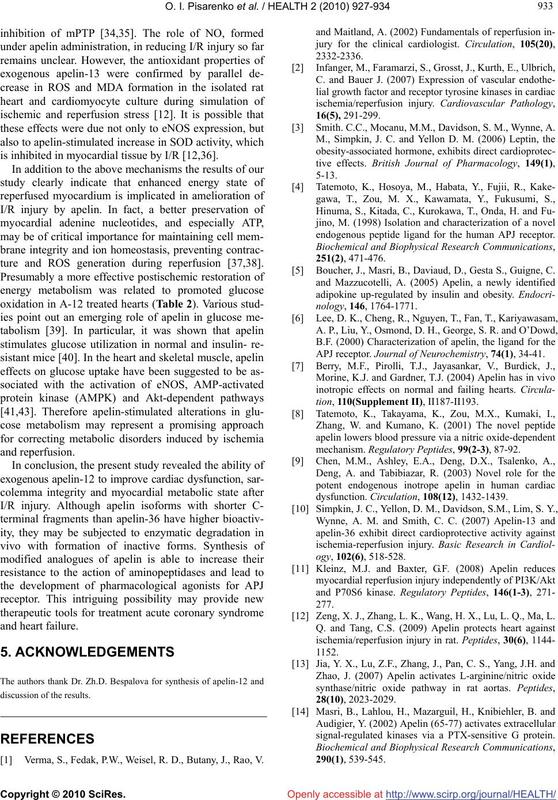 Regulatory Peptides, 99(2-3), 87-92. Zeng, X. J., Zhang, L. K., Wang, H. X., Lu, L. Q., Ma, L.
signal-regulated kinases via a PTX-sensitive G protein. macology. Cell Signaling, 17(4), 415-426. Pisarenko, O. I., Shulzhenko, V. S. and Studneva, I.M. perimental Pharmacology and Physiology, 26(1), 26-31. 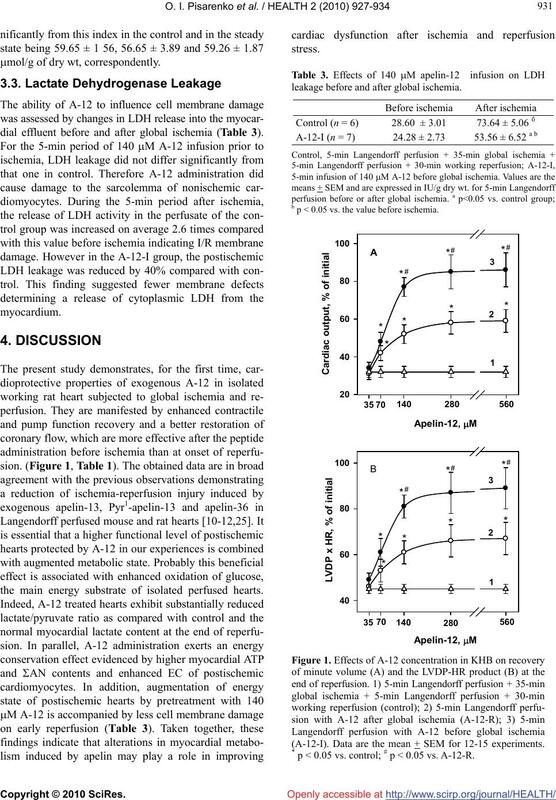 Bergmeyer, H. U., Ed., Methods of Enzymatic Analysis. Academic Press, New York, 1777-1781. Analysis. Academic Press, New York, 2127-2131.
matic Analysis. Academic Press, New York, 1772-1776. Gutman, I., Wahlenfeld, A.W.L. (1974) L-(+)-Lactate. matic analysis. Academic Press, New York, 2253-2259.
demic Press, New York, 574-578. Zeng, X.J., Wang, H.X., Lu, L.Q., Hao, G., Wang, X.Y. cal Pharmacology Bull, 23(1), 82-85. Ronkainen, V.P., Ronkainen, J.J. and Hanninen, S.L. Drugs and Therapy, 21(6), 409-414. 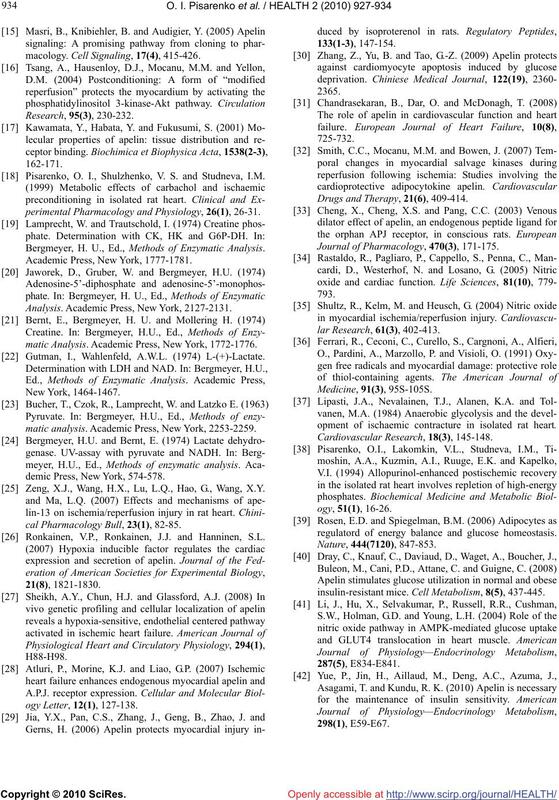 Journal of Pharmacology, 470(3), 171-175.
opment of ischaemic contracture in isolated rat heart. regulatord of energy balance and glucose homeostasis. insulin-resistant mice. Cell Metabolism, 8(5), 437-445.